An animal cell membrane is the barrier between the inside of the cell and the external environment, similar to how skin acts as a barrier for vertebrates’ bodies. The cell membrane structure is a fluid mosaic made of three types of organic molecules: lipids, proteins and carbohydrates. The cell membrane controls the movement of substances like nutrients and wastes across the membrane, into and out of the cell. The basic building blocks of a cell membrane are phospholipids. Phospholipids contain a hydrophobic (insoluble in water) end made up of two fatty acid chains of nonpolar molecules such as carbons and hydrogens. The other end is hydrophilic (soluble in water) and contains polar phosphate molecules. These phospholipids are arranged in a bilayer with their hydrophilic end group exposed to water on each side of the membrane and the hydrophobic nonpolar molecules protected inside the double layer. The lipid layer comprises approximately half of the entire mass of the membrane, depending on the membrane type. Cholesterol is another type of lipid within a cell membrane. 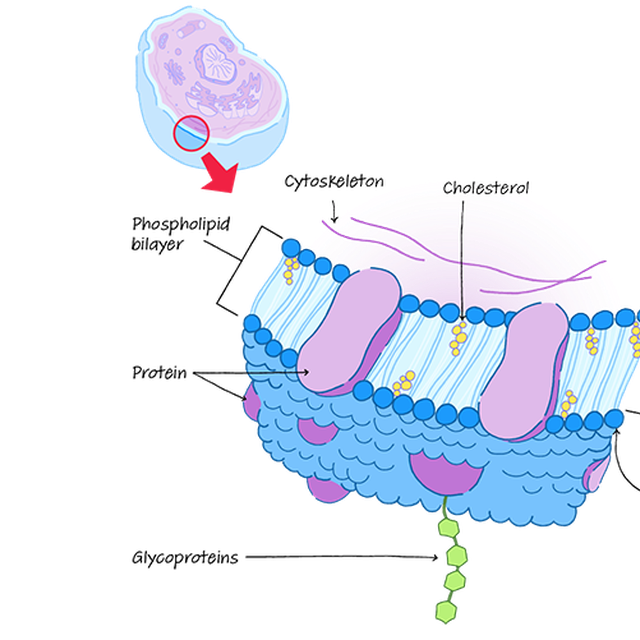 Cholesterol molecules are positioned within the bilayer to link the fatty acid molecules and stabilize and strengthen the membrane. Proteins constitute between 25 percent and 75 percent of the cell membrane mass, depending on the membrane type. Membrane proteins are inserted into the phospholipid bilayer at the exposed surfaces and perform the cell’s various functions. Proteins are considered either integral or peripheral, depending on their association with the membrane. Peripheral proteins sit on one side of the membrane surface and associate indirectly through protein-to-protein interactions. Integral, or transmembrane, proteins are embedded within the membrane, exposed to the environment on both sides. Carbohydrates comprise only a small percentage of the cell membrane but have important functions. Carbohydrate molecules are generally short, branched chains of simple sugar units, and are covalently attached on the cell membrane surface to most of the integral membrane proteins and occasionally to the lipid bilayer itself. When carbohydrates are bonded to the proteins or lipids, they are called glycoproteins and glycolipids. Carbohydrates on the surface of a cell membrane vary significantly among individual cells, cell types, individuals in the same species and species to species. This diversity allows the carbohydrates to function as markers to differentiate one cell from another. The phospholipid bilayer’s main function is to protect and maintain cell structure. The bilayer allows fluidity and movement of the associated proteins for necessary protein interactions. Protein interactions are essential for cell function. Peripheral proteins act as receptors for chemicals like hormones and allow cell signaling or recognition. On the inner surface of the cell, they attach to the cytoskeleton, helping to maintain shape or catalyze reactions in the cytoplasm. Integral proteins transport molecules across the membrane surface, and those that are bound to carbohydrates as glycoproteins are involved in cell-to-cell recognition. Without the diverse carbohydrate markers on the extracellular membrane surface, cells would not be able to sort and differentiate cells during embryo development, for example, or allow the immune system to recognize foreign cells. Quinlan, Sarah. "What Types of Organic Molecules Make Up a Cell Membrane?" Sciencing, https://sciencing.com/types-organic-molecules-make-up-cell-membrane-4260.html. 09 May 2018.